As you can see, it goes on as she tells him, "Why don't you go back to your country where you belong? ...It's not your country. You don't belong here." Granted, nobody really takes kindly to being told what to do, or having a camera pointed at them, but it's funny how quickly the racism tumbles out in this moment. The video was shot near the man's home in the northwest Calgary community of Sage Meadows. He claimed he'd encountered the same woman, estimated to be in her mid-40s, walking with her dogs off-leash in the area a month prior. The area is not a proper off-leash zone and the man said he was shooting video to file a complaint to bylaw officers. As he approaches, camera in hand, the man asks, "Excuse me, could you please leash up your dogs please?" The woman responds, "I live right close." The man replies, "I live right close, too." The woman then states, "Yeah, well, maybe you should go back to China where you belong." As she continues to walk with her dogs, the woman makes continued derogatory remarks, including telling the man, "You don't belong here." 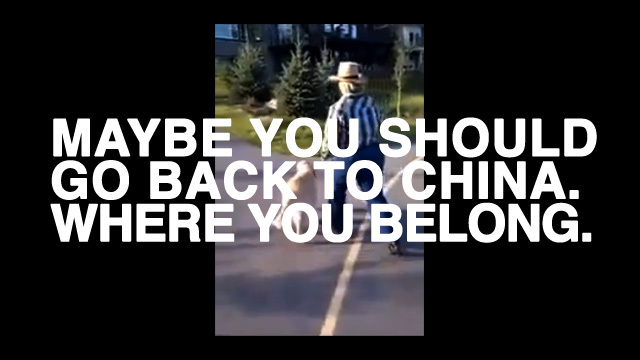 More here: Calgary man 'couldn't believe' dog walker's racist comments.